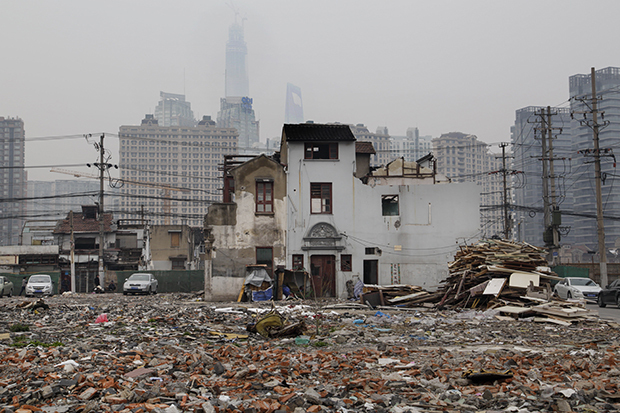 Demolition of Shanghai´s last old quarter, destroyed to make space for new high-rise buildings. Mother and son at dinner in their little grocery. A dream of one’s own home is all that is left. Progress is not inherently “bad,” either. It simply cuts both ways. For every loss, there is an equal and opposite gain—and vice versa. But rarely do we reflect on what is disappearing, until it is too late. 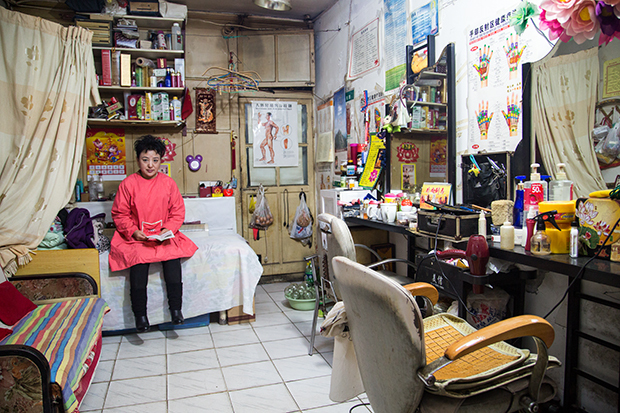 Ukrainian photographer Alina Fedorenko traveled to China in 2014, with a project in mind but as she wandered through the Old City of Beijing, she saw something remarkable that captured her imagination. The historic landscape was being razed and in its place came something extraordinary: skyscrapers that towered high above, effective erasing the community and the traditions of street life that flourished for centuries. Determined to capture this world before it was gone, Fedorenko set out to document the families who held on for as long as they possibly could, creating Symbiosis of Working and Living. She speaks with us about what she discovered on her travels through Old China. Alina Fedorenko: Beijing and Shanghai are forced to grow quickly in order to keep up with the leading cities of the world. I decided to document the disappearance of a beautiful culture. Most of the cities of the world look roughly the same; only the old, untouched parts gives a city her real face. 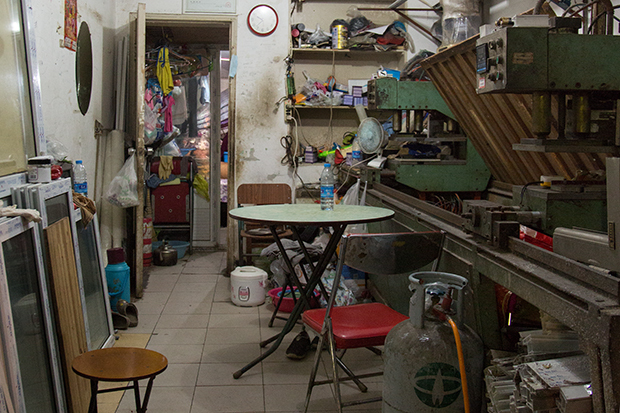 I am amazed by the strength of the families in the old quarters and the ways they support of each other—and even more amazed by their use of space. All somehow fit while we in the West try to live in bigger homes, and at the same time, are more lonely and isolated as from our families. What drew you to document these families? 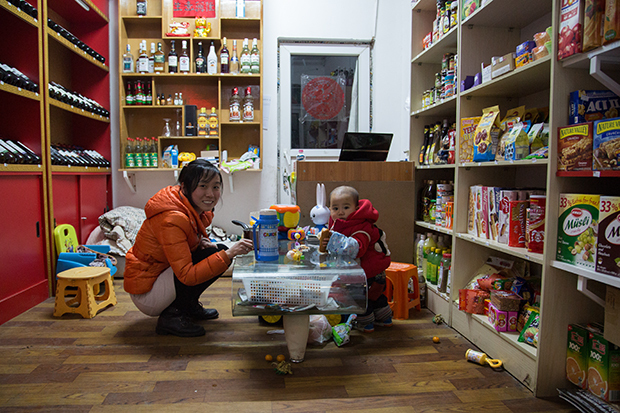 Alina Fedorenko: In 2014, I came to Beijing and rented an apartment between the Hutong area and the high-rise buildings, huge shopping malls, and glass skyscrapers. 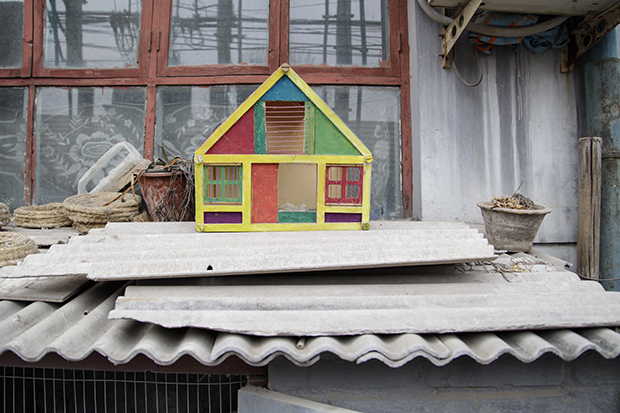 The Hutong area magically attracted me. Once I entered this labyrinth of small alleys, blind ends, and small buildings, I felt addicted to it. You can spend many days walking the same block and every day, you will find interesting details. I spent many days walking around and at some point it was not enough anymore. Life from the outside was unsatisfactory: I was ready for more. I passed so many windows and doors. Sometimes you could look inside through curtains or small gaps. One very cold evening in January, I was standing in front of a door. You could not saw through it: the glass was milky, causing a beautiful arrangement of light and shadows to appear. I spend several minutes in front of that door with only one wish: to step into this world and get to know the way of life. I didn’t have the guts to go inside. My language skills were very poor. I left and got two blocks away before I decided to return. I gathered all my courage, opened the door, and walked inside. The words “hello” and “thank you” were somehow enough to explain myself. This experience gave me the strength, confidence, and power to try it again. It was the beginning of my passion for people at their homes: you never know what is behind a door or a curtain. Every time, it is a surprise. a small heating lamp helps the mother keep her baby warm. 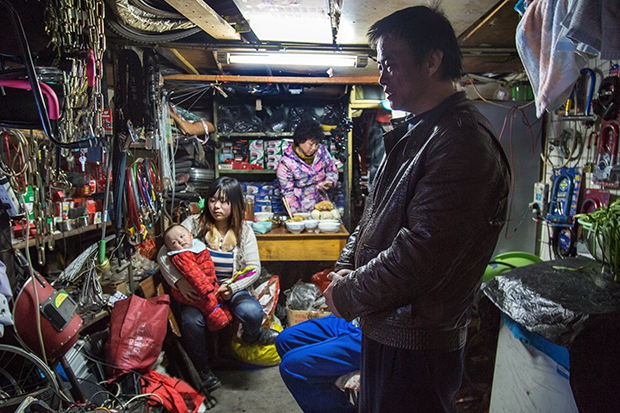 Family dinner at home in a spare parts shop. 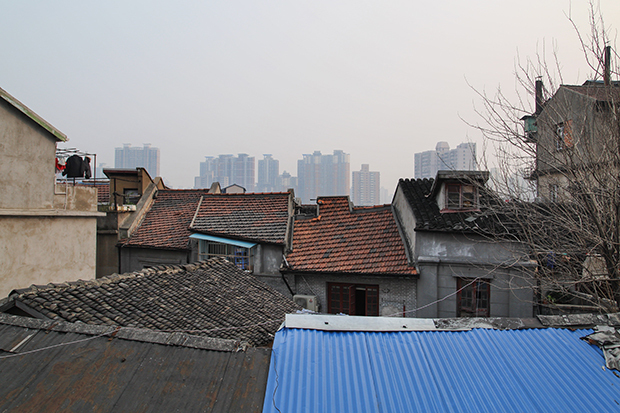 Please describe the Hutong area – what is it like? 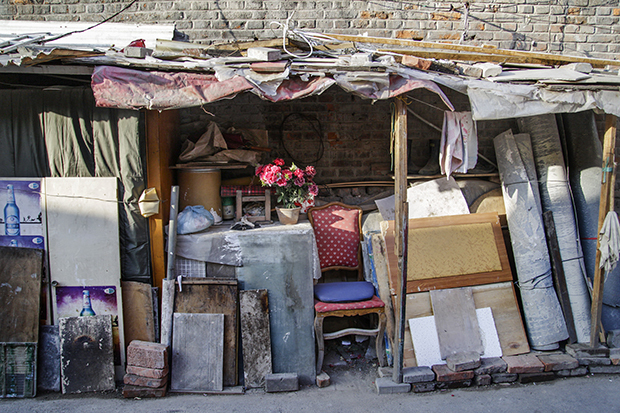 Alina Fedorenko: The Hutong area, also called the Old City of Beijing, is a labyrinth of narrow streets and alleys. Hutongs are comprised of Siheyuan: small, traditional compound buildings made up of rooms around the courtyard, facing south for better lighting. They date back to the Yuan dynasty (1206-1341), and were later expanded in the Ming (1368-1628) and Qing (1644-1908) dynasties. The center of Beijing is the Forbidden City, which is surrounded in concentric circles by the Inner City and Outer City. Citizens of higher social status are permitted to live closer to the center of the circles. The Hutongs were farther from the palace, to its north and south where the commoners, merchants, artisans, and laborers lived..
Nearly all buildings in the Hutongs are grey and built on ground level. 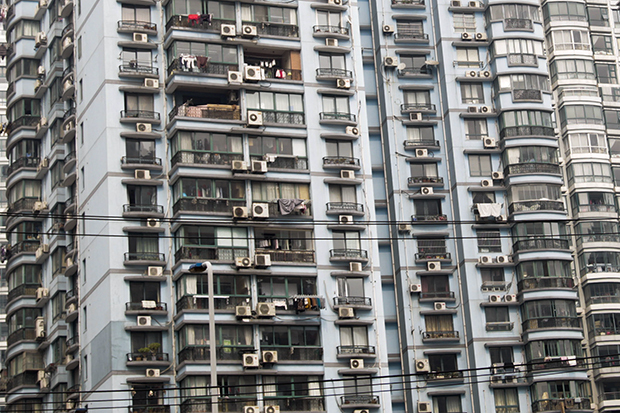 The Hutongs are their own habitats in a big rising city. No cars fits in the small alleys and people are still on bikes or motorbikes, Most of the households do not have proper sanitation systems, and people must share public lavatories. Everyone is instructed to take care for the facilities, together as a community. Although Beijing is a big city, in these areas everyone knows each other. Many have sitting arrangements outside their homes. Socializing is very important for all the residents. In the new, high-rise building areas you can still find old people sitting and observing like they used to do. 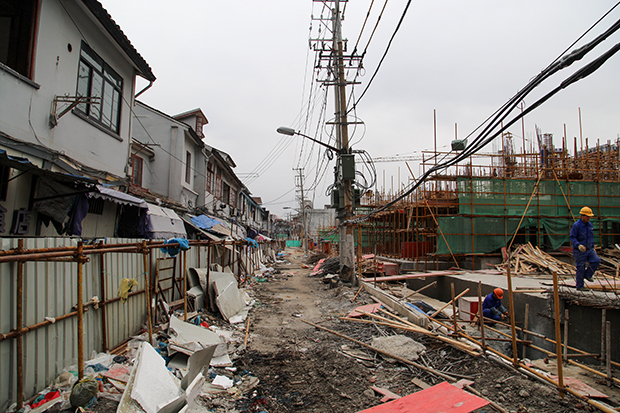 Some of these areas are protected to preserve the Chinese cultural history, while others are being destroyed to make way for new rods and buildings. Over the past decade, rapid development has lead to a remarkable improvement in the quality of life for many citizens. At the same time, much of the historic urban fabric of the capital has been lost. Anonymous buildings everywhere replace the old traditional quarters. Built humble accommodation out of remains. Where in Shanghai did you shoot? Could you describe this neighborhood as well? 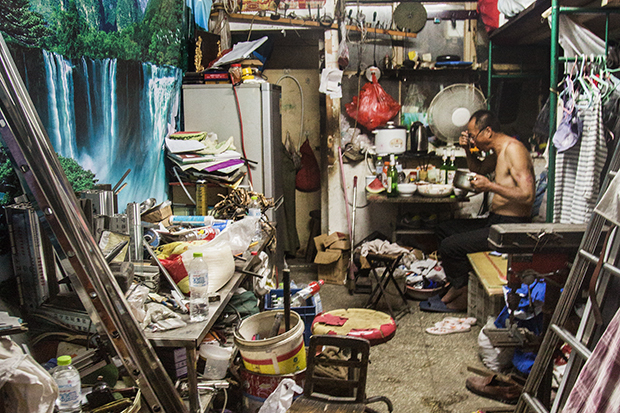 Alina Fedorenko: Most of my photographs of the demolition were made in Shanghai. Here nearly none of the old traditional quarters are remain. I have watched people try to stay in their homes as long as possible. Even if everything around them is leveled to the ground, you can see laundry still hanging. Most of them are by now gone, along with a small part of China’s culture too. Newly built skyscrapers have devoured the new residents and hide them anonymously. The areas I saw where very similar to the Hutong areas in Beijing. The only differences is that the buildings in Shanghai were built on a higher level because Shanghai was built on water. Unfortunately, by 2014 most of the neighborhoods were destroyed. Only very few where left, all waiting for their turn to be the next. How did the families feel about being photographed? Alina Fedorenko: In 2016, I returned to the same places again to see if they still existed and what had changed. This time, I brought my one-and-a-half-year-old son with me. It was quite an effort to find a way back through the narrow alleys of the labyrinth but I was lucky. This time, I gave the people their pictures framed. They were very touched by this gesture and gave us the feeling that we will be always welcome in the future. Many of the people I once met, I never found again – only an empty space of demolition was left and the framed picture as an document of an past existence. The people were happy to pose, smiled bright, and did the most popular hand sign in Asia: the peace symbol. Most of them were positive, very friendly and others were shy. My biggest challenge was to get them not to make the peace symbol, and to keep the moment of the daily routine as untouched as possible. I’ve been traveling by now through several countries, focusing on homes and the daily life of people living in simple conditions. 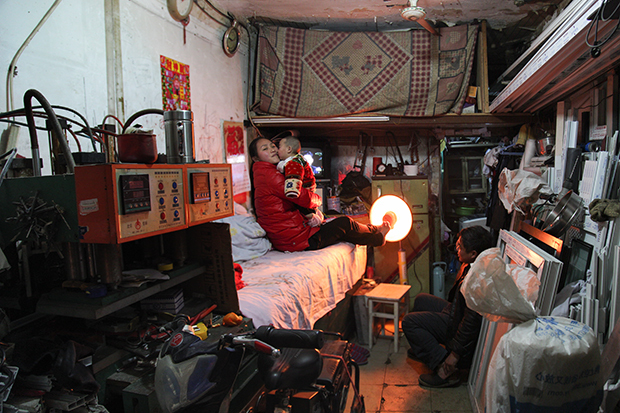 I’ve noticed that people who live in poor conditions create a more familial atmosphere. Families stick together and neighbor keep an eye on each other in a good way. Compared with other places where the living conditions are better, I can see an urgent need to live by oneself, in more spacious apartments, with a bigger need for privacy. Our world become colder. We lose the ability to hold together. We lose old values, traditions, and the simplicity of life by trying to reach for more and more. Humans can arrange themselves anywhere, in any conditions. What is important is not to forget the simplicity of life and to count one’s blessings. After work, at home in a window repair shop. People stay at their homes until the very end. 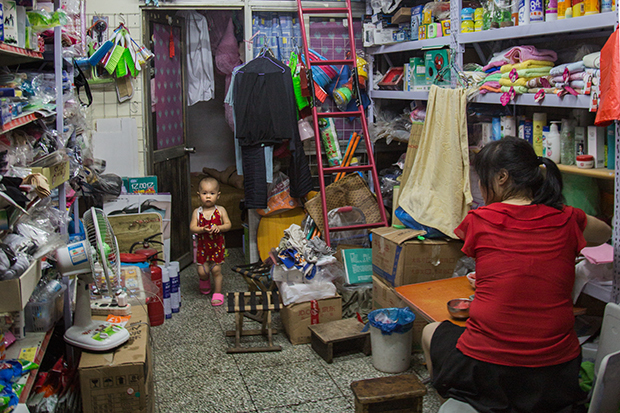 Mother with two children at their household supply store. The high rise buildings approaching. All images: © Alina Fedorenko.